house of spoon: Salvaged timber put to good use! I wanted to frame my favourite painting, gift of the artist herself but hate hate HATED the way that smooth shiny bevelled framed looked against the canvas. So because of this, the masterpiece lil'pill (my favourite artist) had made was hanging sadly frameless (but still fabulous) in my front lounge. Enter SuperD with some (very bad quality, thin and green(!!)) 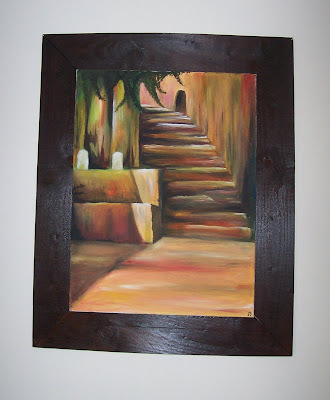 salvaged timber which he sawed hammered and glued into a frame for me to paint with deep dark wood paint. Just kidding - I'm honestly so chuffed that you have it out anywhere and my new cyber fan base is just such a compliment! ps - your last post was aaages ago - and I check everyday too! !